Need a new protective style? Going on vacation soon? Have no clue what you’re going to do? Well, help is here and it comes in the form of Senegalese Twist braids. Originating from West Africa, the style has been around for centuries. These hair twists are sometimes referred to as “rope twists” for their small and string-like appearance. Typically, Kanekalon hair is used to give a smooth look. Installing the braids involves wrapping fiber extensions around the roots of natural hair. Then, the hair is twisted in two-strands from the root to the end of the hair shaft. Some of our favorite actresses like Gabrielle Union-Wade, Brandy and Joy Bryant have been spotted wearing these twists. You too can have this look. Even if you are cash strapped, and, you can do this in the comfort of your own home. STEP ONE – wash and detangleWash, detangle and dry your hair before braiding. Avoid using thick conditioner or heavy oils on your hair as this will make hair slippery and these products can clog your follicles.Part your hair into sections. They should be equal in size for continuity. Tie these sections with small hair clips to keep hair away while you braid. STEP TWO – prepare extensionsPrepare extensions to desired size and length. Be sure to keep the same amount of extension hair for each strand. Lay the center of the fiber extension over your natural hair and begin to twist and coil them. Do this by grabbing your own hair and the fiber hair in between your fingers and twist to the right until it coils. Then, secure the extension hair before weaving it. STEP THREE – braid from the rootWhen braiding down from the root, overlap the right-hand section of hair with the left. Continue to twist and coil the hair until the hair is finished. The braid should be sturdy and stay in place without being sealed immediately. Continue steps two to three while working on each section. Once finished, dip in hot water and treat the ends with oil to lock moisture. Wash your twists at least once a week. Use a diluted shampoo or apple cider vinegar. Apply light oil and spray moisturizer to your scalp several times a week. This helps seal in moisture and hydrates your hair. For help with products, check out this article. Spray liquid leave-in conditioner on your braids daily. Braid spray promotes optimal hair health. Sleep with a silk or satin scarf. Keep style for six to eight weeks. Try this style and tell us how it worked for you…. And don’t forget to share with your friends. It is close to the end of the year and you know what that means – holiday time! But the cold and dry temperatures also mean that it’s the season for protective hairstyles. If you’re looking to try something a little different, crochet twists might be the perfect style for you. Crochet twists are a low maintenance hairstyle installed by adding extensions using a crochet needle on existing hair that is cornrowed. They are done without the use of sew-in and therefore cause less stress on the hairline and on the budget. No one knows the origins of the hairstyle but historic records suggest that it has been around since the 16th century. It became popular in the Americas in the late 90’s and 2000s and has recently risen to prominence due to the strong natural hair movement. 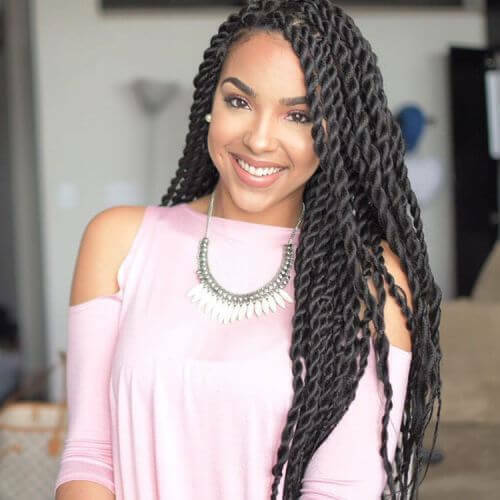 Why should Crochet twists be your next hairstyle? Crochet twists are just as easy to put in as they are to take out. You’ll never spend more than three hours in a chair installing them and never more than 30 minutes maintaining them. Unlike weaves and lace fronts, there is no need to use thread, bonding glue, caps or other adhesives that can cause breakage, shedding or allergies. It is also kind to the pocket as fiber extensions are affordable. Expect to cough up between $29 and $50 for a six-pack and it is unlikely that you will pay north of $100 for everything (unless you live in Canada :). How can you install crochet twists at home? Ensure that your hair is clean and moisturized before cornrowing. Cornrow hair to desired pattern – preferably a simple straight back pattern to make life simpler. Prepare fiber. You should use the same amount of hair for each crochet for evenness. Start from the top or bottom of scalp. Slide the open latch needle into cornrow. Place strand of fiber in the hook. Close latch and pull the needle through hair to the midway point of the fiber. Secure the fiber by pulling the tail all the way to tighten. If you want to show your popping edges, you can leave a little bit of your hair out. Ensure that the hair you leave out is taken care of, i.e., wash and condition regularly and moisturize and seal every day. Try using extensions similar to natural texture to have a unified look. How long can I leave my crochet braids in? It is recommended that crochet braids be kept in 4-8 weeks max. Maintenance is fairly easy in terms of day-to-day styling. However, washing is where things get tricky. Crochet twists make it difficult to get to the scalp, but there are ways in which you can clean your roots to prevent clogging and build up. To wash, use a spray bottle with either watered down shampoo or apple cider vinegar. Gently massage your scalp. Then methodically rinse out the mixture in your hair. Also, co-wash the fiber hair and use products according to the texture of the extension. Outside of washing, moisturize your cornrowed hair using leave-in conditioner and use either Aloe Vera or a light moisturizing mixture for the extension hair. At night, use a satin bonnet and if you have high volume hair, tie it up so that it can be covered. For more advice on how to take care of your crochet twists, click here. How do I remove crochet twists? Removing your crochet twists depends on whether you want to keep the extensions or whether you want to reuse them. Be careful with this process as improper removal can tangle your hair. After removing all the extensions, unravel your cornrows and the crochet knots should fall off as you do so. Crochet twists are the perfect gift for your hair this festive season and will save you time, money and your precious hairline. Tell us what you think about Crochet Twists and… share the magic with your friends.